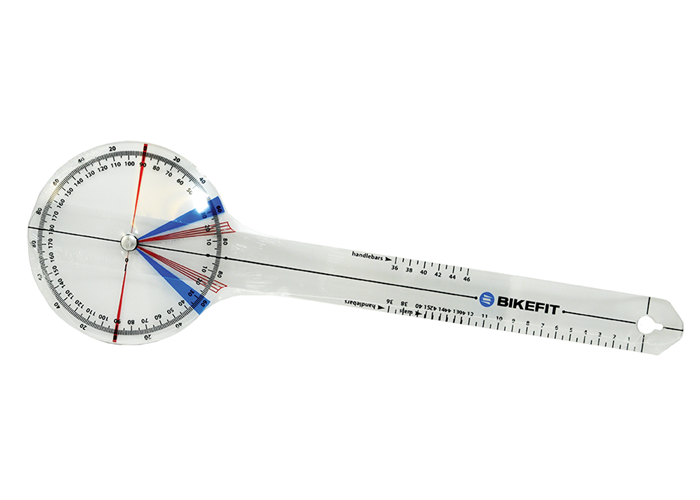 A Goniometer is a "must have" for bicycle fitting. The BikeFit Goniometer (aka G-meter) was specifically built for cycling and is color-coded for easily and quickly determining joint and body position angles. A Goniometer is a "must have" for fitting bicycles. The BikeFit Goniometer (aka G-meter) was specifically built for cycling and is color-coded to easily and quickly determine joint and body position angles which are used to determine proper seat height, stem height and length, etc. The Goniometer includes measurement gradients for both handlebars and stems. Manufactured in the USA of clear plastic, it is 16" long when folded but with its arms extended it is longer than most medical goniometers.